The entire AJ Glass team is committed to providing our customers unparalleled service and extraordinary craftsmanship. On every job, our commercial glass experts achieve excellence and give the project their full attention – from design to fabrication, from installation to completion. It’s why clients choose to work with us – because they know they can trust their project in the hands of metro Atlanta’s best. From the first day on the job, we instill a zero punchlist philosophy in our employees. It’s our commitment to making sure no detail goes unnoticed and no final item is left unchecked. The experts on our team are trained to assess, diagnose and review every step of the design, fabrication and installation process. The AJ Glass uncompromising attention to detail and steadfast pursuit of excellence is reflected in the quality, service, and success of every project. AJ Glass is owned and operated by Lori and Curt Gerken. Lori is a graduate of Florida State University and is a registered CPA. Prior to founding AJ Glass in 2002, she has over 15 years of commercial real estate experience in accounting, asset management, property management, construction, and financial oversight. Curt is a graduate of Southern Polytechnic State University with a Degree in Mechanical Engineering Technology and has 10 years of mechanical design and engineering experience and, prior to AJ Glass, has 10 years of project management and operations experience. Need us to review detailed specs for an upcoming project? Have issues with a recent installation from a different contractor? You’re in good hands with AJ Glass. We offer innovative, custom designs for commercial and retail spaces, including heavy glass entrances, glass walls, painted glass, aluminum frames, and storefronts. Painted glass complements any work space – from office suites, to collaborative and common areas, to elevator lobbies and corridors – with function and modern beauty. All custom metal fabrication is done locally in metro Atlanta in our AJ Glass warehouse, and our retrofit hardware specialists are experts in the industry. At AJ Glass, giving back the to community is part of our culture. In December of 2017, AJ Glass participated in the Big Bike Build to benefit Toys for Tots hosted by HITT Contracting. 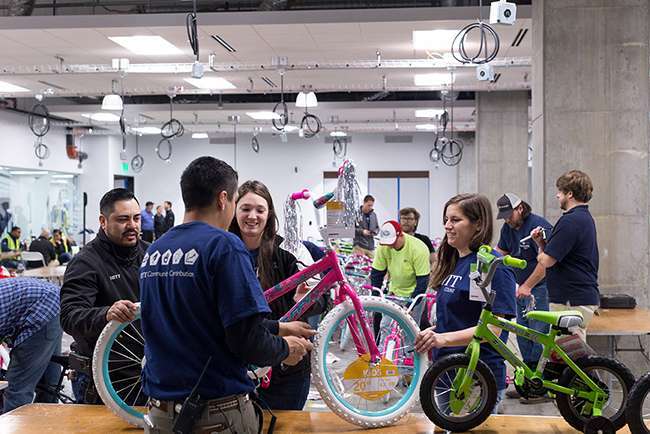 On the day of the event, more than 200 people converged on the NCR job site, taking turns assembling bikes, inflating tires, checking work, and tying a bow on each finished product. By the end of the day, the team built 1,006 bikes, but the generosity didn’t stop there. In addition to the bikes, they presented the Atlanta chapter of Toys for Tots with a check for $25,000. To view additional photos of the event, click here. This organization is a community based warehouse facility that directly assists the general public in identifying and implementing best practice green building-related concepts. The idea is to reduce solid waste disposal and promote resource efficiency. Since beginning operations in late 2011, LBC has diverted more than 1,400,000 pounds of reusable building materials from area landfills and donated more than $500,000 in materials to 55 nonprofits and schools. In short, the mission of LBC is to make the lifecycle use of the built environment increasingly efficient and sustainable. This non-profit animal rescue organization provides life-saving services for homeless pets in Georgia, many of which are rescued from local kill shelters. The animals are given a full medical evaluation and needed medical care. Once healthy, animals are placed in foster homes until they can be transported to partner shelters in the Northeast, where they are adopted by fully screened families. Typically, animals remain in foster homes for only 2-4 weeks. Road Trip Home rescued 1,800 animals in 2014 and 2,090 in 2015. AJ Glass helps this organization in many ways—President and CEO Lori Gerken serves on the Board of Directors, and as a family, the Gerkens’ help with events—but their favorite role is being foster parents to puppies!